Experiencing nausea while running can be due to a variety of factors. Dehydration, malnutrition, heat exhaustion and overexertion are common causes. Taking some simple precautionary steps before and while running can help you avoid nausea in many cases. If, however, you find that you are experiencing nausea consistently while running, despite taking precautionary measures, you may have an underlying gastrointestinal disorder. Consult a doctor if this is the case. Drink plenty of water. Dehydration is the primary reason runners experience nausea, according to the MarathonTraining.com website. To avoid dehydration, start hydrating the day before you run and drink 1 to 2 cups of water right before you begin to run. If you are going on a long run, carry water with you and take small sips while running. 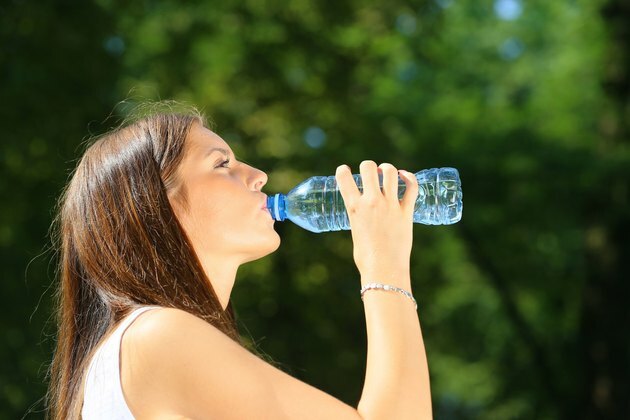 Avoid drinking too much water, however, because that can lead to nausea as well. Consuming water or a sports drink enhanced with electrolytes can help if you are sweating a lot. Eat something before you run. Hypoglycemia, or low blood sugar, is a lack of glucose in your blood, Glucose is the body's main source of fuel, and it won't function properly without it. When you start to run and your body is already low on fuel, you can start to feel nauseous. Other symptoms you may experience include hunger, irritability, confusion and fatigue. Eat a smaller meal at least two to four hours before you run, or consume a small snack no more than 30 minutes before running to avoid hypoglycemia. Avoid eating too much too soon before you run as a full stomach while running can cause cramping and possible nausea. Avoid the heat and humidity. Running in hot, humid weather means your sweat won't cool you down as much, and you can easily become dehydrated. Heat exhaustion can lead to feeling fatigued, nausea, cramping and dizziness. Run when the weather is cooler, such as in the mornings or evenings. If you are running indoors, make sure the room is properly ventilated. If you start to feel nausea while running due to heat, stop and find a cool, preferably air-conditioned, area to rest. If you don't feel better after 30 minutes, seek medical attention. Pace yourself. Overexerting yourself while running can lead to nausea because your body cannot get rid of the lactic acid quickly enough. Lactic acid is a waste product that gets produced into your muscles while running. The lactic acid builds up in your stomach, and you may feel nausea, which can be quickly followed by vomiting. Keep a steady pace while you are running, and don't run for so long that you start to feel sick. While many runners consider it a sign you are working hard, it is not healthy. Consult a doctor if you experience nausea consistently while running. If you are taking precautions to avoid nausea, but find that you are still having the problem, a gastrointestinal disorder could be causing the problem and running is only making it worse. Common problems that can cause nausea are gastritis and irritable bowel syndrome. Other medical disorders, such as heart problems, can also cause nausea when running. Other factors that can cause nausea are stress and motion sickness, which can be made worse by running. A doctor can check whether there are any organic causes of motion sickness. Why Do I Feel Dizzy While Exercising?